If you have the chance to get or buy one which will you pick? Do the Swipe and Nokia N9 combo hooked you already? Or it is the Metro UI on the Nokia Lumia 800 that is more strikingly attractive for you? Or maybe the monstrous and unbeatable camera of Nokia N8 paired with Symbian Belle is still your top priority? Let us know what you desire through the voting and dropping your comments. 2 – N8 for camera and Symbian Belle that in future will be Symbian C… etc. 3 – 800 because I like Windows Phone but it has many limits that I haven’t on Symbian. Any news about Belle? Anyone? It’s hard to decide between the swype and the N8; the 12mp camera is a must, but why can’t it have Harmattan XD? There’s nothing wrong with Belle, it’s just outdated, and it seems as if almost everyone that’s tried the N9’s interface thinks of it as revolutionary, and they don’t want to go back. Of course it’s not just the software; there are some improvements which are evident, and which would be very important to consider when investing on a phone: display size, battery, NFC, procesor, etc. The N8 was great when it came out, but now other than the camera and bluetooth it seems as if the N9 is better as hardware in every aspect. I think i’d get an N9. Plan B is rather difficult: the camera seems to be one of the few aspects to consider the N8 over the Lumia… i don’t know how far would symbian go in the matter of improvements, but Microsoft seems more reliable in that sense. Don’t worry about the camera of Nokia N9. It performs good for me esp on macro shot. Being that the N9 and Lumia 800 aren’t available here, it’s the N8! 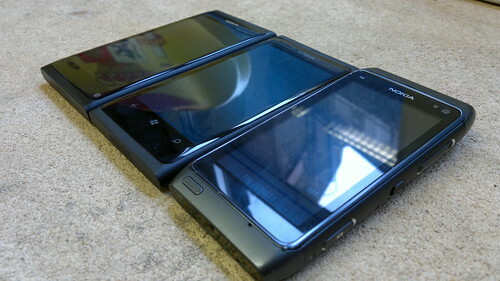 Pingback: Symbian Directory » Poll: Nokia N9 or Nokia Lumia 800 or Nokia N8 with Symbian Belle – Which One To Get? I have both the n9 and the n8, and i will buy the 800 too! Three Gorgeous Devices with three unique software platforms. meego is dead so it means no apps and winpho is too restricted, so n8. u better check howmany apps out there already! N9 is about Qt not MeeGo! n8 because belle camera, n9 theres few mhz more than, don’t make no sense. and mango :/ lumia it’s good, but should be belle. I don’t understand WHY n9 there’s 8mp, because ITS 9, MORE THAN 8, should be better, ok, i’ll do some chocolate cake and I put vanilia, ITS A NEW CHOCOLATE CAKE, nokia, pls, dont do it again. put something GOOD, not a few good, it’s like iphone4 and 4s, if u have 4, wait for the 5. 4s it’s better a few. not to much. One day, will there Nokia with Ios5 HAHAHA or android.